Do you want to use less fuel while enjoying better comfort and reliability? 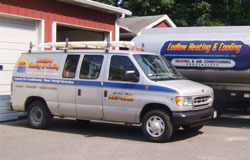 Ludlow Heating & Cooling's annual tune-up is for all types of heating equipment and fuel types. A heating system that runs at peak efficiency can help you save up to 10% per year on fuel expenditures. When your system is tuned and maintained properly, it is an investment in equipment longevity. Your heating system is the most important "appliance" in your home, and one of the most costly to replace. Keep it running reliably, efficiently, and safely with an expert tune-up from one of our knowledgeable and friendly technicians. Call us at (413) 583-6923 to schedule your annual tune-up today!